6 pin solid brass "C" keyway Mortise Cylinder standard. Optional: Schlage E, Schlage C-K, Russwin D1-2-3-4, Corbin 59/60, Sargent LA-LB-LC, Falcon/Weiser E, Arrow A, Yale 8, Yale GA and Kwikset. Can also accept Medeco, Assa, Kaba and Cal-Royal HSK High Security Cylinders. 2 15/16" width x 8 1/2" length. 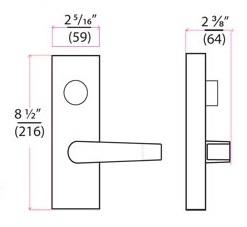 Lever length 4 3/4". Fits and covers 2 1/8" 161 cutout.